Fitbit Surge was introduced almost a year ago in January, 2015 at CES. I had a chance to try it out for a few months, and of course I was comparing it with the Apple Watch. Sometimes other runners would smile when they noticed that I had two watches on my wrists -- the Apple Watch on the left and the Fitbit Surge on the right wrist). The design of the Fitbit Surge is typical of other Fitbit products. It features a elastomer band available in three colors (black, blue and tangerine) that almost seamlessly turns into a thick and rather bulky device with an original, but far from subtle design. The watch is thicker towards the outer side of the wrist, which causes its screen to be tilted at a slight angle. That feature makes the Fitbit Surge easier to look at. You do not need to turn your wrist as much to see the screen clearly as you would with the Apple Watch or other smart or classic watches. The Surge definitely catches one's eye, either for good or bad. It's worth mentioning that this device is available in three sizes: small, large and extra large. The size is listed on the front of the package. The large model looks quite good on my wrist, however I am as bulky as the device itself. The main and most visible part of this smart watch is its display, which is a rather small 1.26 inch (32mm) LCD greyscale touch screen. It's smaller than the front panel of the watch, so there is a black bezel around it. Both the screen and bezel resemble that of the Pebble Steel. Of course the screen is LCD, not e-ink, with greater resolution and it is touch-sensitive. Using simple one finger swipe gestures, it's easy to navigate through menus and views - the current time, steps taken, distance walked, floors climbed and calories burned to name a few. The screen is always on and there is a backlight that is activated with a tap on the screen. Unfortunately, the screen is too dark for me even when it is backlit. Sometimes I really had to stare at it to read the information on the screen. The watch controls aren't limited to the touch screen; there are also three buttons, one on the left and two on the right side. Fitbit Surge has a waterproof rating of 5 ATM, which means it can easily be submerged to 10 meters (32 feet). However, according to Fitbit it can only resist sweat, rain or a splash of water and should not be used while swimming or taking a bath or shower. That reminds me of the Apple Watch, which Apple says cannot be taken underwater (my own Apple Watch survived a simple swimming pool test). On the bottom side of the watch case (the side that touches the wrist) there is a heart rate sensor that uses photopletysmography - a non-invasive method that illuminates the skin with green light and measures changes in light absorption. It is more or less the same method used as in the Apple Watch. The Fitbit Surge can continuously monitor the user's heart rate, which is measured every five seconds during regular activity, and every second during an exercise. The results are usually the same as those provided by the Apple Watch. Next to the heart rate sensor is a charging cable port. Fitibit uses its own standard, so you definitely want to keep an eye on the charging cable. That's a bit annoying, but Fitbit isn't an exception. Almost all the smart bands and watches I had a chance to try use different charging plugs (Pebble watches, Apple Watch and a few other devices). The Fitbit Surge should work from 5 to 7 days on a single charge. In my own testing it worked from 4 to 7 days, roughly the same as promised in the technical specifications. Battery life depends a lot on use of the built-in GPS. The more frequently it is used, the faster the battery is depleted. The great thing is that the built-in GPS tracks a workout without having to also carry a smartphone. All gathered data, including the recorded path, is synced with a smartphone or to the Fitbit web service via a computer. The other built-in sensors are a three-axis accelerometer, a three-axis gyro, a compass and an altimeter. Fitbit Surge tracks distance, steps, floors, burned calories, heart rate, activity time and quality of sleep. There is no need to activate the latter measurement, as the device detects when you fall asleep. Many different kinds of activities can be recorded including hikes, runs, bike rides and more. All data gathered can be easily viewed in the iOS app or via the Fitbit web service. The user has to set up a personal account in order to use both the app and the website. The iOS app works with all Fitbit devices, displaying stats for daily, weekly and monthly activity and workouts. There is even a graph that is updated every time the Surge syncs with the app, displaying changes in heart rate over time. Since Fitbit Surge is not only a fitness band but also a smart watch worth to mention of its other features. It provides a simple clock functionality with four very simple watchfaces. I would like to see something more complex, with weather forecast and daily activity progress bar or circle (like on Apple Watch). There is also a vibration alarm. Unfortunately both watch face and alarm can be set up only in the app on iPhone. As a long time Pebble watch user who migrated to Apple Watch last spring, I can not understand it. It is just strange. The Fitbit Surge shows simple notifications for incoming calls and text messages, both SMS and iMessage, but there are no notifications for other apps like Twitter, Facebook, etc. because there is no way to install any third-party app on this device. Surge does have a very simple music controller that works fine with Spotify, but doesn't work with Apple Music. It shows the title of a song and the artist or band of a song currently being played. The buttons on the right side of the watch work as pause/play and skip forward controls. The Fitbit Surge merges fitness band functionality with a very basic smart watch. Because of that, it is definitely a better option for people who are mainly focusing on activity and workouts and who don't need a more sophisticated smart watch or just don't want to wear both a traditional watch and a smart band at the same time. Measuring activities is the primary function of this device and thanks to a bunch of sensors and GPS it can work independently of a smartphone. Basic smart watch functionality is only an addition to this device. 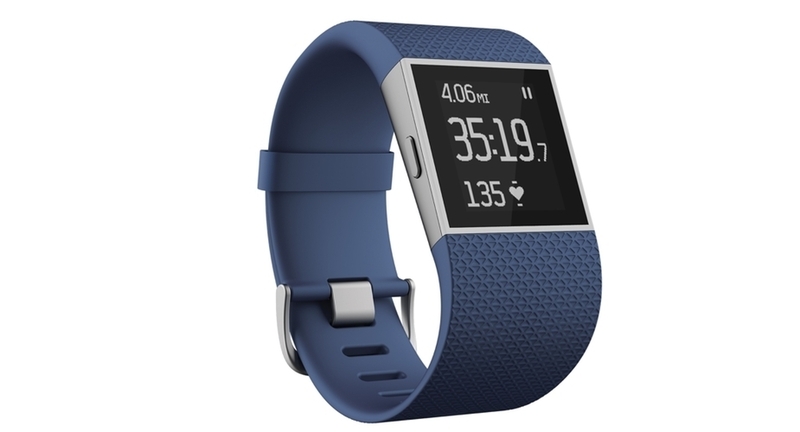 You can get a Fitbit Surge at Fitbit.com for $249.95.